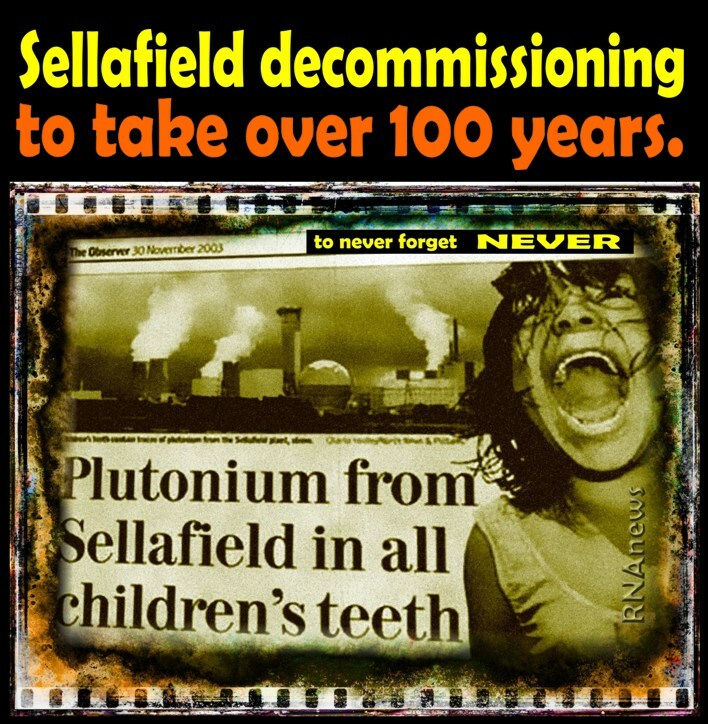 Sellafield decommissioning to take over 100 years. Now it's confirmed. Sellafield decommissioning to take over 100 years. Now it's confirmed. ► Download the entire Report in PDF HERE. 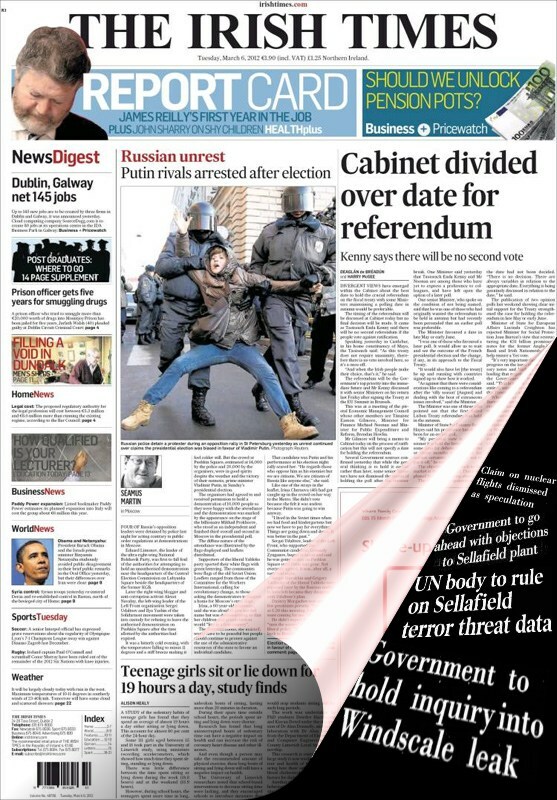 ★ A report from Westminster’s Public Accounts Committee revealed by The Irish Times and BBC seven years ago is now confirmed by the National Audit Office. In a progress report on the work, the National Audit Office criticised the Nuclear Decommissioning Authority (NDA), which oversees the plant, for delays in cancelling a cleanup contract with the consortium Nuclear Management Partners (NMP) after demands from MPs a year ago to do so. Here the entire report. It will take more than 100 years before the toxic nuclear site at Sellafield is safe, it was revealed, for the first time, 7 years ago, in a report from Westminster’s Public Accounts Committee (PAC) published by BBC and The Irish Times in July 2008, that was warning about the cost of decommissioning of all nuclear plants was likely to rise because successive governments and the industry found it easy to push costs on to future taxpayers. According to the article of The Irish Times published in 2008 a spokesman for Sellafield Ltd said: “Sellafield isn’t a place that can just be closed down. It is about the removal of plant and equipment from the building, it is about decontaminating and knocking them down - that takes decades. He said it would cost £73 billion (€91.3m) to decommission over the next 112 years. The report said the contract was terminated only last month, at a cost to the taxpayer of £430,000 in cancellation fees. Margaret Hodge, the Labour chair of the Commons public accounts committee (PAC), which will question civil servants and the NDA about the costs next week, said the rise was astonishing and railed at managerial incompetence at the plant. “Despite my committee’s calls in February 2014 for the Nuclear Decommissioning Authority to make big improvements, the cost of cleaning up the nuclear waste at Sellafield continues to soar,” Hodge said. “The authority’s work at Sellafield is not just costing more, it is also taking much longer than planned, and for 2014-15 it looks like work will be behind schedule for the fourth year running. So, costs and times (already astronomical) for the dismantling of the nuclear site at Sellafield in Britain, will rise again. The upward revision was made official by the National Audit Office who explained how the Authority for nuclear decommissioning, public entity that oversees the site, has indicated the prediction of closure of the entire process for 2120. In addition, the Authority has indicated that it will take almost 73 billion euro to complete the job, so 5 more than indicated in the forecast announced last year. 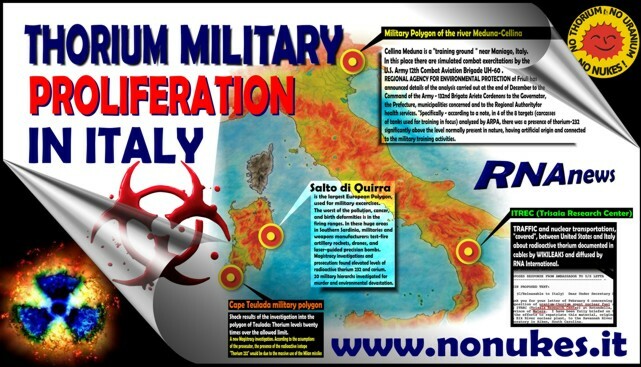 The Sellafield site for its history of disasters and sufferings inflicted upon to population in the name of "market democracy"... is the best expression of nuclear "technology" and crimes perpetuated behind the "draft shield" of the "reason of state". Ireland is to take the British government to arbitration over proposals to open a new plant at the nuclear reprocessing centre at Sellafield, it emerged last night. The action, which is thought to be the first case of one state taking another to an international tribunal for violating freedom of information rules, is likely to exacerbate tensions with London following years of arguments over the Cumbrian complex. bodies they fund have used their resources efficiently, effectively, and with economy. Our studies evaluate the value for money of public spending, nationally and locally. as well as legacy storage ponds and silos for nuclear waste material from the UK’s first generation of nuclear plants. The Nuclear Decommissioning Authority (the Authority) owns Sellafield and 16 other UK licensed civil nuclear sites. The Authority is an arm’s-length body, sponsored by the Department of Energy & Climate Change. buildings and untreated waste on the site and the age of its facilities. Since nuclear operations began in the 1940s, successive operators did not give sufficient thought to decommissioning or retrieving and disposing of radioactive waste. There are around 240 buildings on the site that are operating nuclear facilities or buildings containing radioactive materials. Some are deteriorating or fall short of modern standards and pose significant risks to people and the environment. 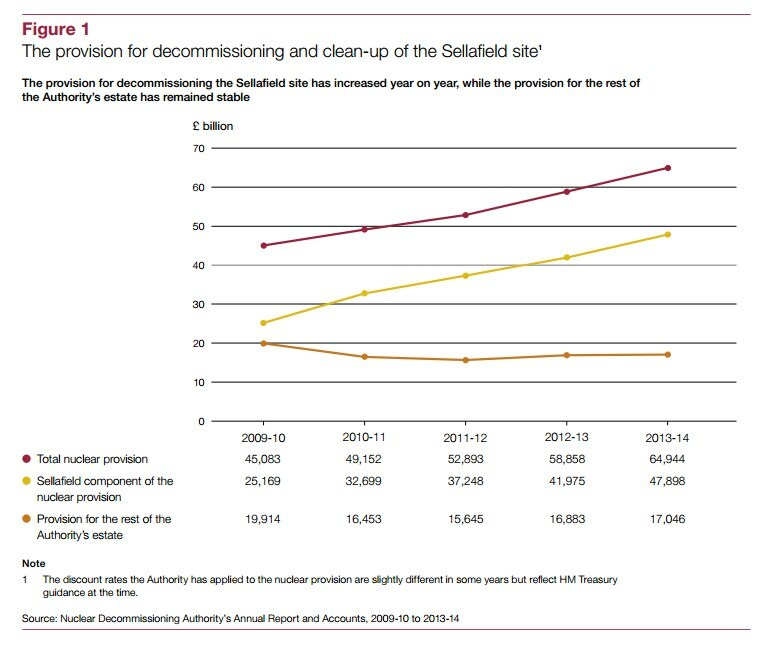 The Authority’s estimate of the lifetime cost of decommissioning and cleaning up the site has been increasing year-on-year. 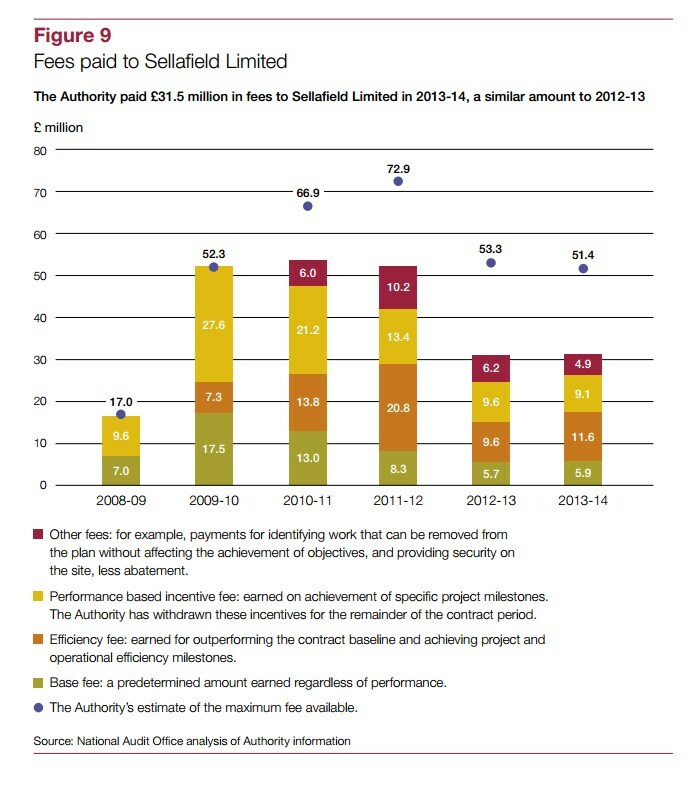 The Authority reimburses Sellafield Limited for its expenditure on the site and pays base and performance fees to Sellafield, who may pass them to Nuclear Management Partners as dividends. The Authority regains ownership of Sellafield Limited when the agreement ends, but the agreement also includes a clause allowing early ‘termination for convenience’. 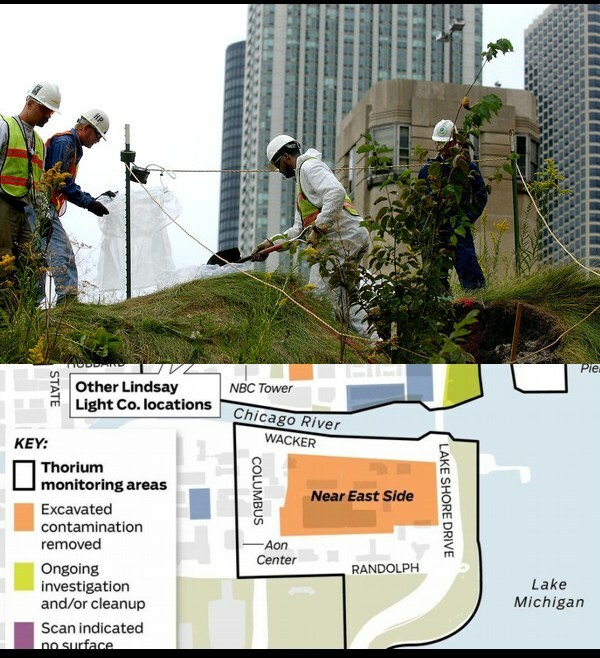 1.5 In September 2013 the Authority continued its agreement with Nuclear Management Partners into the second 5-year period of the 17-year agreement. 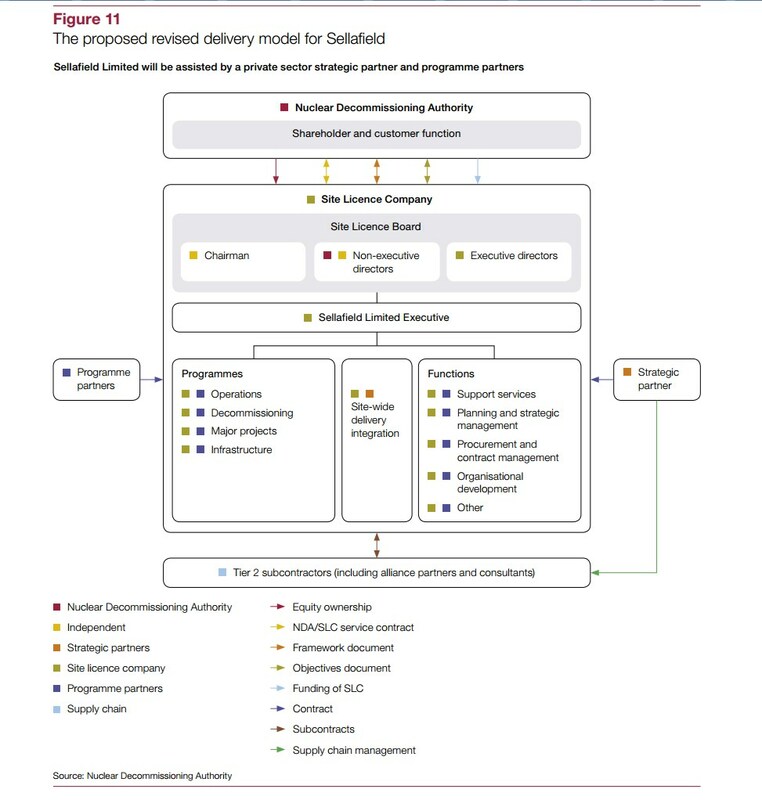 In January 2015, after a strategic review of the delivery model at Sellafield, the Authority announced its decision to terminate its contract with Nuclear Management Partners and implement a new delivery model. 1.7 This update explains developments in the management of the site at the end of the current Parliament. The update presents data the Authority published, or that it gave to us, and summarises the Authority’s documents and explanations of progress. We have checked the consistency of the data to sources, where possible, but we have not audited the Authority’s underlying records. 1 The Sellafield site includes three licensed sites: Sellafield, Windscale and Calder Hall. 3 Comptroller and Auditor General, Assurance of reported savings at Sellafield, Session 2013-14, HC 778, National Audit Office, October 2013. 4 HC Committee of Public Accounts, Nuclear Decommissioning Authority: Managing risk at Sellafield, Twenty-fourth Report of Session 2012-13, HC 746, February 2013. 5 HC Committee of Public Accounts, Progress at Sellafield, Forty-third Report of Session 2013-14, HC 708, February 2014. 2.1 Decommissioning and cleaning up Sellafield will involve completing current commercial operations and decommissioning and demolishing the buildings on site. The highest hazard facilities on the site are the four legacy ponds and silos. The Nuclear Decommissioning Authority’s (the Authority’s) strategy prioritises making clear progress on these programmes. In this part we address progress at site level, on the legacy ponds and silos programmes, and on the largest projects on the site, many of which are within the legacy ponds and silos programmes. 2.2 The Authority aims to clear the Sellafield site by 2120. The Authority’s detailed work schedule for the site provides for decommissioning and clean-up work to be complete by 2135 but the Authority expects to be able to complete decommissioning by 2120.
the Sellafield provision at nearly £48 billion after discounting future cash flows. This is around 74% of the Authority’s total nuclear provision of nearly £65 billion and an increase of nearly £6 billion (14%) since March 2013. The estimated provision for the rest of the Authority’s estate has remained relatively stable (Figure 1). 6 - Vitrification is the process of turning waste into glass. 2.4 Between 2010-11 and 2013-14 the nuclear provision for Sellafield has increased by more than £15 billion. More than £12 billion of this is from increases in estimates of the cost of work required to complete decommissioning and clean up across the site. The rest is from other changes including the approach to discounting and inflation, and reductions in the estimate of the provision because of work done in-year. Between 2012-13 and 2013-14, cost estimates increased by more than £6 billion, driven by increases in some major project costs and the removal of previously assumed efficiencies that had been built into the performance plan but which the Authority subsequently deemed to be unachievable. 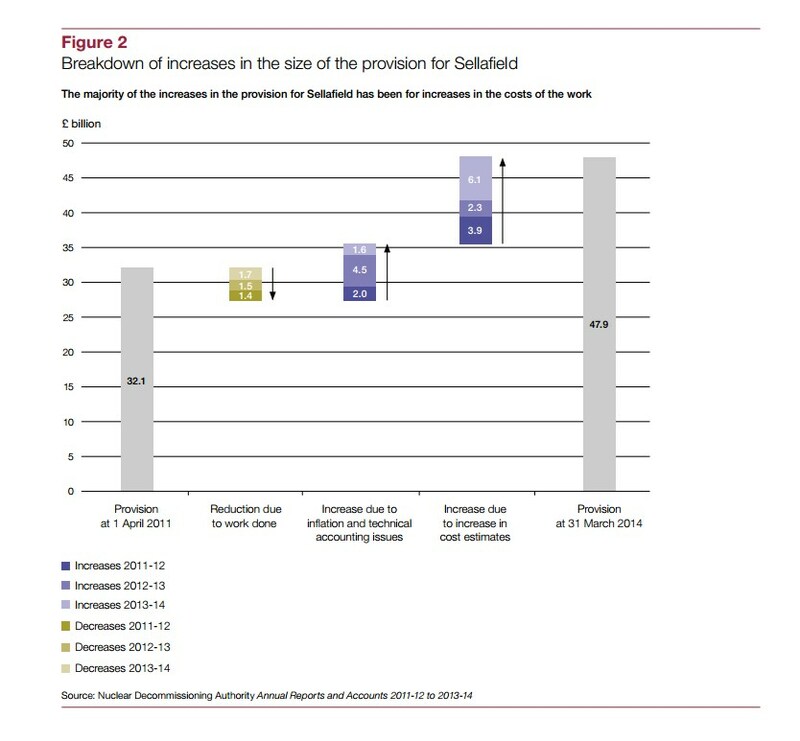 Figure 2 shows the breakdown of increases in the provision for Sellafield between 2010-11 and 2013-14. 2.5 The Authority considers that the increase in its lifetime cost estimates is mainly because it now has a better understanding of the scale and nature of the risks and challenges on the site. In particular, it reflects an improving understanding of the challenges, potential technical solutions and uncertainties still involved in the decommissioning projects and programmes to retrieve, package and store high risk, hazardous materials. It also reflects a more realistic assessment of the level of efficiencies achievable within the plan. We discuss these projects and programmes in more detail later in this part. 2.6 The Authority bases its management judgement of the overall nuclear provision on the lifetime plans for the sites across its estate. The Authority had intended that its Board would approve a new lifetime plan for Sellafield in April 2014. However, this did not happen until December 2014. This delay was due to Sellafield Limited delivering its proposed plan late and the Authority’s Board deciding in July 2014 that it was unacceptable. 2.7 As at February 2015, the Authority’s estimate of the discounted nuclear provision for the Authority’s estate was around £70 billion, of which £53 billion relates to Sellafield (an increase of £5 billion from 2013-14). We have not yet audited these figures. We are reviewing the Authority’s assurance over the 2014 performance plan as part of our audit of the Authority’s financial statements for the year 2014-15, so that the Comptroller and Auditor General can reach an opinion on whether the financial statements, including the latest estimate for the nuclear provision, are true and fair. 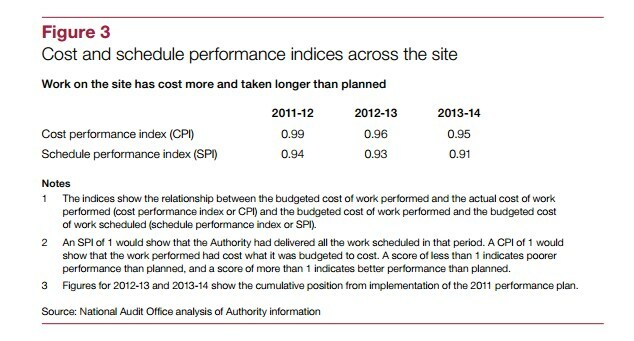 2.8 Since the May 2011 performance plan, work on the site has cost more and taken longer than planned (Figure 3 on page 10). The Authority and Sellafield Limited routinely monitor performance on cost and schedule against the performance plan for the site. It monitors performance at an aggregate level, based on detailed data for the projects within the 23 programmes on site. Cost and schedule performance against the plan deteriorated slightly between 2012-13 and 2013-14. During 2014-15 performance has improved, with in-year costs being slightly less than planned, and progress against schedule being closer to, though still behind, plan. 2.9 As well as decommissioning activity, Sellafield Limited also carries out commercial operations, mainly fuel reprocessing. 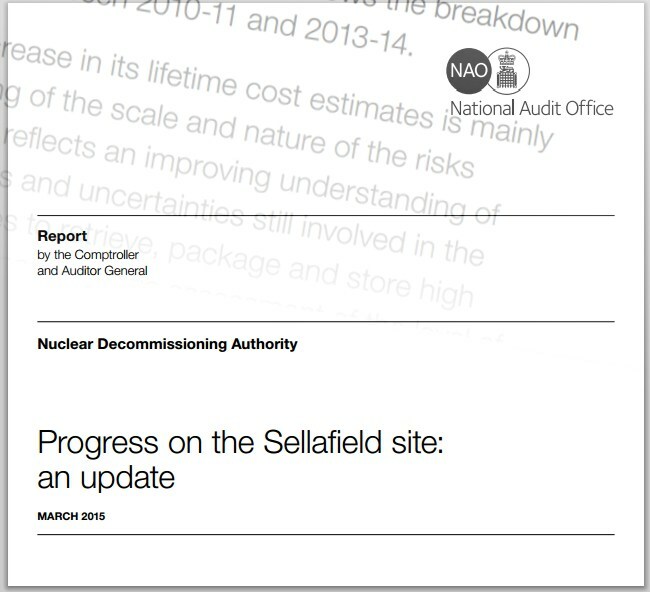 The Committee of Public Accounts (the Committee) highlighted in its February 2014 report that Sellafield Limited had rarely achieved its output targets for its reprocessing operations. It noted the Authority’s explanation that the varying performance from year to year reflected the stretching targets it had set and the inherent fragility of the old reprocessing plants. the target for 2014-15 was set much lower (Figure 4). 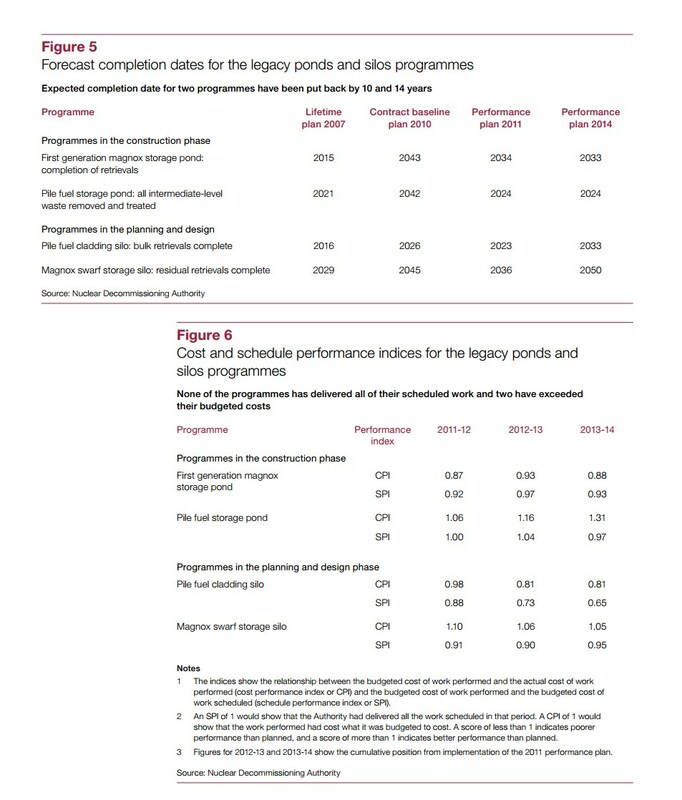 2.10 Estimated completion dates for the four legacy ponds and silos programmes were extended significantly between 2007 and 2010 and brought forward again when the Authority agreed the 2011 performance plan. In its latest lifetime plan, Sellafield Limited has made little change to its estimated forecast completion dates for the two pond programmes which are in the construction phase. Sellafield Limited has put back its expected completion dates for the two silos programmes, by 10 and 14 years respectively. These programmes are in the planning and design phase and Sellafield Limited has re-evaluated its estimates of the time it will take to retrieve waste (Figure 5 on page 12). 2.11 The revisions to the completion dates for the legacy ponds and silos in the 2014 performance plan reflect slower progress than expected over recent years and Sellafield Limited’s improved understanding of the challenges that may be involved. Sellafield Limited has not met the planned schedules in the May 2011 performance plan for any of the four legacy ponds and silos programmes. It has fallen behind schedule the most on the pile fuel cladding silo programme and made best progress on the pile fuel storage pond, where progress is just behind schedule. It has delivered the work at lower than the budgeted cost for two of the programmes but exceeded it for the other two (Figure 6 overleaf). 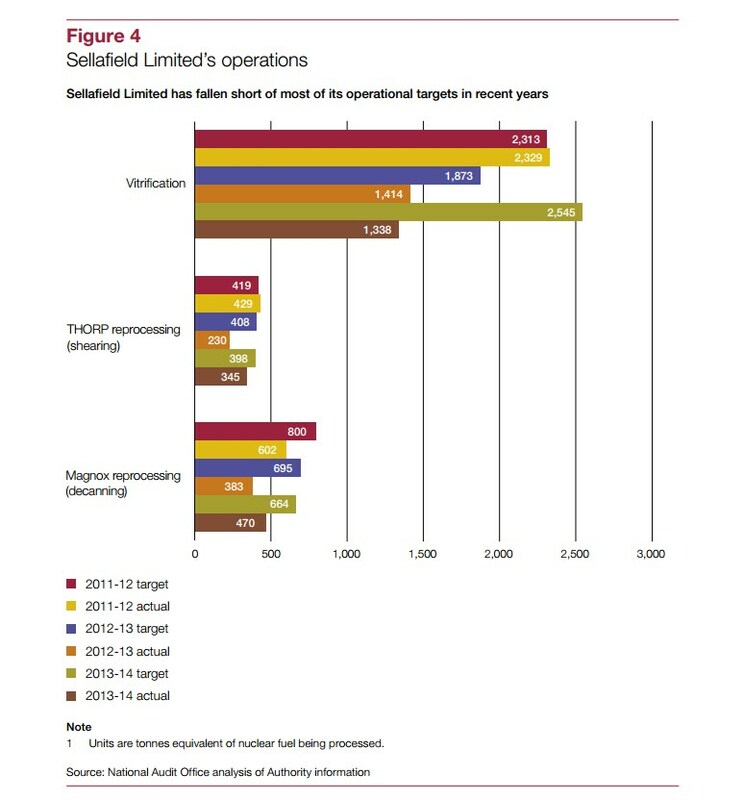 2.12 We reported in 2012 that Sellafield Limited had made poor progress on its portfolio of 14 major projects. Many projects fall within the legacy ponds and silos programmes, providing bespoke equipment, buildings and systems to remove, treat, package, move and store waste. 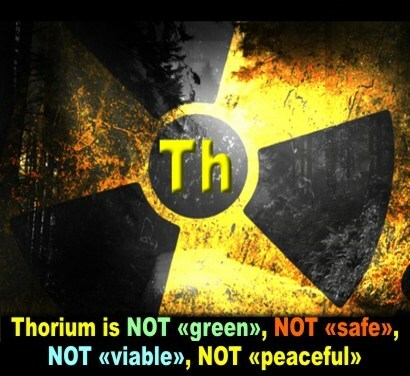 Some relate to the operation of the site and reprocessing spent nuclear fuels. We reported delays and cost overruns on projects in planning and design, where schedules and costs may be particularly uncertain because of the uncertainties of the volume and nature of the waste and the technical solutions needed to manage the decommissioning. We also reported poor progress on projects in the construction phase. The Authority has provided updated cost and schedule data for the projects that we reviewed (Appendix One). Two of the original projects in planning and design have since been cancelled or incorporated into other projects. Three of the major projects in construction have been completed, with little further cost escalation or delay since 2013, and two projects have moved from planning and design into construction. One further major project has entered the planning and design phase. Therefore, of the original fourteen projects, nine remain active, with three in planning and design and six in construction. 2.13 Sellafield Limited has put back considerably most of the nine remaining major projects since they were initiated, putting back the completion dates further since September 2013. In aggregate, Sellafield Limited has put back the estimated completion dates for the three projects still in planning and design by 143 months since they were initiated. Eighty six months of this change in estimated duration has occurred since September 2013. The vast majority of the changes relate to two complex retrieval and treatment plants: pile fuel cladding silo and silos direct encapsulation plant. 2.14 Sellafield Limited has put back the estimated completion dates for the six projects now in the construction phase in aggregate by 271 months since they passed their design gate (the date the project design is approved to begin construction). 100 months of this change has occurred since September 2013. Since September 2013 the increase in duration is largely attributable to the magnox swarf storage silos retrieval project and the box transfer facility, both of which have been deferred to align with the revised silos direct encapsulation plant availability. 2.15 The estimated completion dates for two further projects – the box encapsulation plant product store direct import facility, which is in planning and design, and the silos maintenance facility, which is in construction – were extended by 12 months between September 2013 and December 2014. This was due to under-estimation of the scale of the challenge and the need to align the projects with the magnox swarf storage silo programme. This has resulted in the total lifetime costs of the remaining nine major projects increasing to around £7 billion. In addition, one new project – the box encapsulation plant project – has gone into the design phase. This project has been accelerated in order to accept waste from the magnox swarf storage silo ahead of the availability of the silos direct encapsulation plant. The Authority estimates that this project will cost around £492 million. 7 - The Authority estimates time and cost ranges for projects. 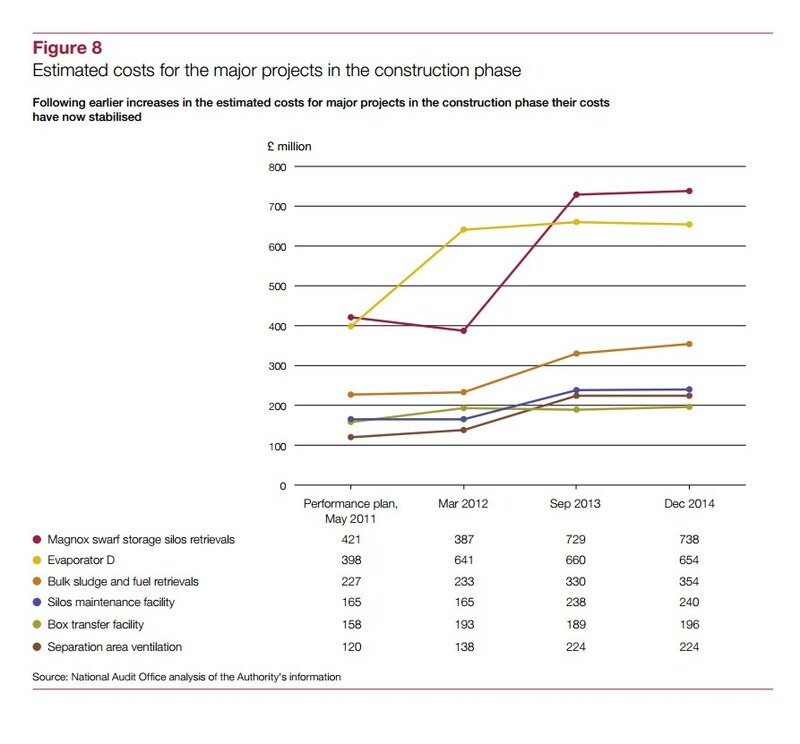 In this report we have used the Authority’s mid-point estimate for the estimated costs of major projects. After a quantification of risks, the Authority considers there to be a 50-50 chance that costs will come in below this mid-point estimate. 2.17 The estimated cost of the silos direct encapsulation plant has doubled from £1.3 billion in September 2013 to £2.7 billion in December 2014 (Figure 7). In 2012 we reported that this is the third attempt to design a plant to receive, treat and immobilise the waste from the magnox swarf storage silo. At that time Sellafield Limited was planning to recompete the project. Since awarding the contract Sellafield Limited has confirmed its cost estimate with greater certainty, but has moved its expected completion date back from August 2020 to June 2026. This project has accounted for the majority of the overall extension to completion dates for major projects. 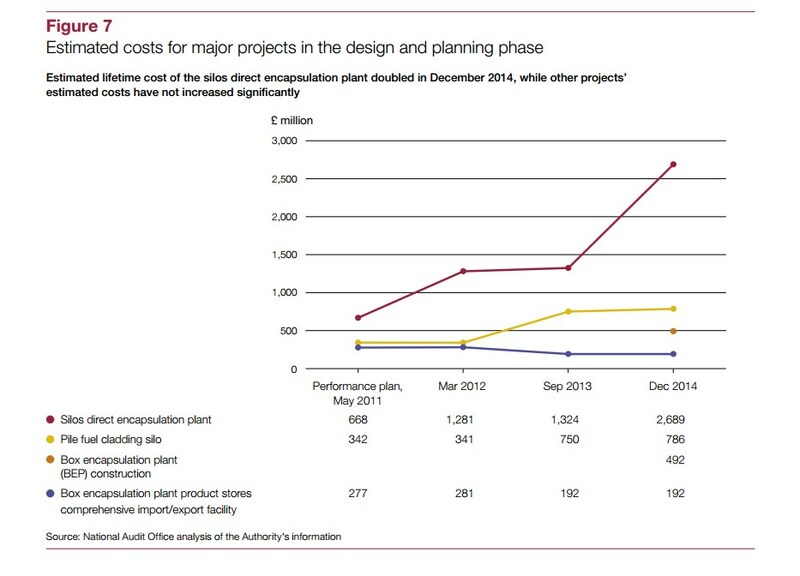 2.18 The magnox swarf storage silos retrievals project and the pile fuel cladding silo project, which accounted for a significant proportion of the increase in estimated costs from March 2012 to September 2013, have not shown further significant increases in their estimated costs to December 2014 (Figure 7 and Figure 8). The Authority expects further clarification of costs and schedules on the pile fuel cladding silo project – in due course. The project is to construct equipment and systems to safely remove radioactive waste from the storage silo. It is to commission its first machine in 2017, when the Authority expects there to be an opportunity to reduce the risk of the overall programme. The end date for the delivery of the final machine is linked to the silos direct encapsulation plant project and so the project’s final completion date has been put back from 2023 to 2025 (Appendix One). The project is at the design stage for integrated systems for retrieval of the waste from this silo, and is being re-planned. The Authority expects the revised plan to reduce the uncertainties in the proposed approach and result in a more robust cost and delivery schedule. We reported in 2012 that the Authority had reviewed Sellafield Limited’s use of executives and reachback. The Committee concluded in its 2013 report that Nuclear Management Partners had not provided the leadership critical for success at Sellafield, and that the Authority should monitor, and challenge where appropriate, the use made of Nuclear Management Partners’ executives and experts and the terms on which they are employed. 8 - ‘Reachback’ refers to Sellafield Limited’s use of staff from Nuclear Management Partners’ companies at Sellafield. 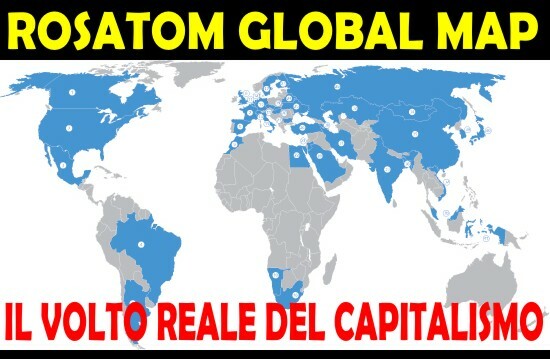 2.20 The Authority committed to continue to monitor and challenge the appointment of Nuclear Management Partners’ executives and experts and these costs have fallen. The Authority estimates that the cost of seconded executives, including salary, tax, expenses and incentives, has reduced to £6.4 million in 2014-15 from a peak of £11 million in 2011-12. There were 14 full-time equivalents in executive positions between 2012-13 and 2014-15, reduced from 17 in 2011-12 and 19 in 2010-11. The Authority estimates that the cost of reachback – including salary, plus overhead plus reasonable expenses – will have reduced to less than £10.8 million in 2014-15, from a peak of £25.1 million in 2012-13. The number of full-time equivalents is forecast to reduce to 40 in 2014-15 from 92 in 2012-13. Procurement, contracting and project management. 2.21 In January 2013 the Committee expressed concern that taxpayers were bearing the financial risks of delays and cost increases, as all bar one of the major projects at the site involved a cost reimbursement contract between Sellafield Limited and its subcontractors. The Committee recommended that the Authority should determine how and when it will have achieved sufficient certainty to expect Sellafield Limited to transfer risk down the supply chain on individual projects and then to reconsider its contracting approach for the site as a whole. The Authority reports that it is still aiming to complete its intended review of procurement and contracting across the Sellafield programme by December 2015, to identify the scope for transfer of delivery risk to the private sector. It reports that it has taken a first step by identifying where work is sufficiently certain to support transfer of more delivery risk to the supply chain in its assurance of the 2014 performance plan. charge of security – was missed, but this post has now been filled. 2.23 Sellafield Limited is due to finalise its new socio-economic strategy by the end of March 2015, in response to a recommendation from the Committee of Public Accounts, and has reported some increase in its use of apprentices and commitment to skills enhancement and its spending with small and medium-sized enterprises. In April and September 2014, the Authority and Sellafield Limited jointly published progress updates on their approach to developing skills and contributing to socio-economic development in and around Sellafield. In 2014 Sellafield Limited had increased its use of apprentices, trainees and graduates by nearly 40% since 2012; and in 2013-14 increased its direct spending with small and medium-sized enterprises to 7.6%, with total Sellafield supply-chain spending with small and medium-sized enterprises now being 19%. 2.24 To the end of the first five-year term of the contract, the Authority has paid a total of £237 million in fees to Sellafield Limited for meeting its targets and objectives, from which Nuclear Management Partners receives payments as dividends. This is in line with the £230 million the Authority previously advised the Committee it could be (Figure 9). The Authority has not yet finalised the level of fees that Sellafield Limited will receive in 2014-15, against its assessment of maximum fees available for 2014-15 of around £53 million. At the time of our October 2013 report, Assurance of reported savings at Sellafield, the Authority was forecasting that Sellafield Limited would achieve total efficiency savings between 2008-09 and 2013-14 of £691 million compared to a target of £699 million (in 2012 prices). Efficiency savings drive one of the main incentive based fee categories, alongside performance in meeting project milestones and identifying work that can be removed from the programme without affecting overall progress on the site. In October 2013 we reported, in response to a request for assurance from the Committee, that the Authority’s systems for recording, scrutinising and challenging claimed site-wide savings at Sellafield provide moderate assurance of reported overall savings. 9 - The original target for site-wide savings was £796 million over the period (2012 prices). During 2012-13, the Authority removed legacy ponds and silos from the efficiency fee mechanism as it sought to incentivise progress on the ground rather than cost efficiency. It is for this reason that the efficiency savings target was reduced. 3.1 In September 2013 the Nuclear Decommissioning Authority (the Authority) announced that it would continue the contract with Nuclear Management Partners into its second 5-year period. 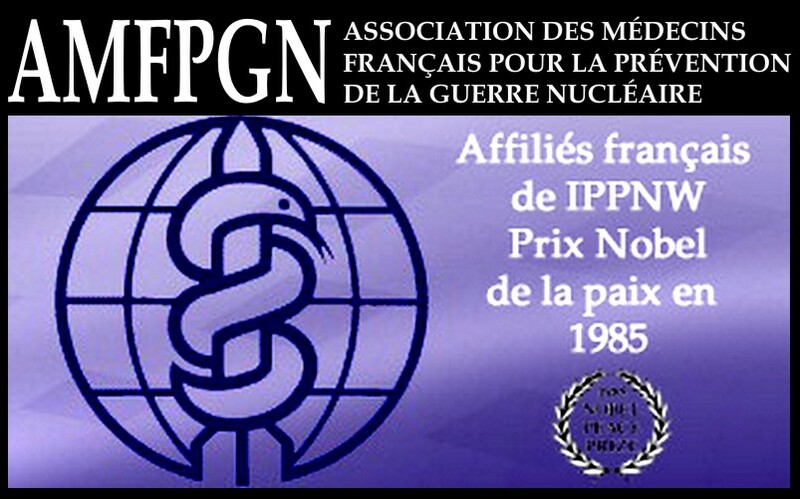 It acknowledged to the Committee of Public Accounts that performance had been worse than expected, and explained that with the Department’s agreement it had extended the contract with Nuclear Management Partners because it considered this was the best option available at the time. The Authority told the Committee that in reaching this decision it had explored two alternatives: to re-let the contract; or to dispense with the parent body and operate with Sellafield Limited as a subsidiary of the Authority. In addition, the Authority stated that it could use the ‘termination for convenience’ clause in the contract at any time. 3.2 In its February 2014 report, the Committee concluded that “(t)he Authority has not demonstrated why, given the lack of risk transferred to (Nuclear Management Partners) this ‘parent body’ arrangement at Sellafield provides value for money”. The Committee recommended that the Authority, “should set out how it might transfer more of the delivery risk to contractors under its existing arrangements and how it will ensure that its alternative arrangements are viable to enable it to terminate the current contract should performance continue to prove unsatisfactory”. In its response to the Committee’s recommendation, the Authority stated that it has “viable alternatives to the current contractor, contract and PBO model. These alternatives will be maintained and developed further during 2014”. “identify the business model for the operation of Sellafield Limited that best secures the outcomes of safety, expedited remediation of the high-hazard facilities and value for money (including risk transfer)”. • reviewing delivery models used on major programmes in the public and private sectors and the nuclear and other sectors. • Option 3: a ‘market-enhanced site licence company’, with the Authority taking back ownership of Sellafield Limited from Nuclear Management Partners, and Sellafield Limited contracting with a strategic partner to bring in the required private sector expertise. 3.6 The Authority took steps to gain assurance about the quality of its strategic review. For example, it used a panel of industry experts to provide advice about the options being considered, and in December 2014, the Major Projects Authority carried out a Project Assessment Review of the process. The Major Projects Authority review found that the case for change had broad support and that the Authority had managed its stakeholders well. The Major Projects Authority also stated that additional assurance about the Authority’s role in managing the transition could strengthen the process further. Authority and Sellafield Limited to proceed with transition, with particular attention to the implementation plans, the risk strategy and the realisation of benefits. • Simplicity of relationships and accountabilities between the main parties. • Improved ability to incentivise long-term outcomes in smaller-defined packages of work given inherent uncertainties on the site. • More enduring and motivating leadership within Sellafield Limited. • Better access to the market for enhancing and developing capability. • More opportunities to transfer delivery risk from Sellafield Limited to the market. 3.8 The Authority concluded that the market-enhanced site licence company could bring significant savings and benefits compared with the alternatives. The Authority’s business case states that the appraisal was designed to compare the three options, not to provide a baseline against which to measure the costs and benefits of the new model. The main reasons for the higher forecast net benefits of the market-enhanced site licence company are reduced costs through lower payments to the private sector partner and the potential for greater efficiency savings. We have not audited the assumptions underpinning the Authority’s analysis. 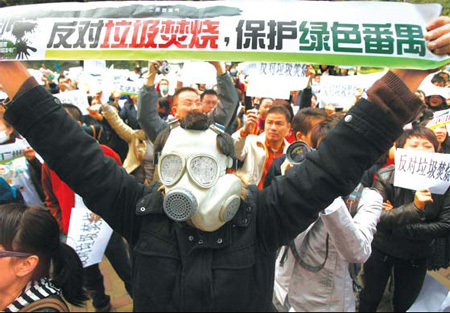 3.9 In January 2015, Ministers at the Department and HM Treasury and the Department’s Accounting Officer approved the Authority’s recommendation and the Authority decided to terminate its contract with Nuclear Management Partners. It will cost the Authority around £430,000 to break the contract with Nuclear Management Partners. 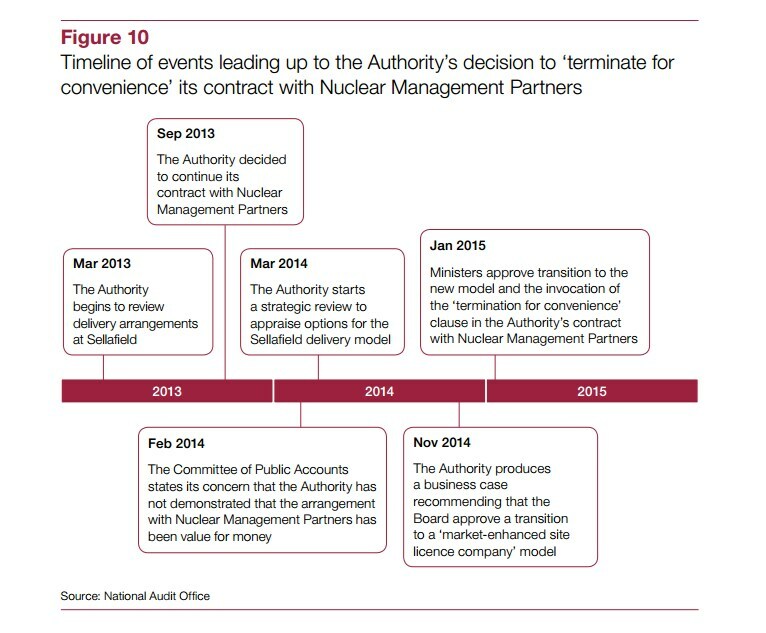 Figure 10 shows a timeline of events between the Authority’s decision to continue its agreement with Nuclear Management Partners and the decision to terminate for convenience. 3.10 Under the Authority’s revised model, Sellafield Limited will be assisted by private sector partners rather than being owned by a private consortium (Figure 11 overleaf). • the Sellafield Limited Board will be chaired by an independent non-executive director, with support from three independent non-executive members. • Sellafield Limited will recruit a strategic partner and potentially a number of programme partners from the private sector to provide it with additional expertise. • supporting delivery of decommissioning and clean-up through management of contracts and integration of activities across the site. that the majority of potential fees for the strategic partner and programmes partners will be available in the final phase, upon delivery of savings and meeting milestones. 3.13 The market-enhanced site licence company model is similar to those that we have seen on, for example, the construction programme for the London 2012 Olympic and Paralympic Games and Crossrail. The Olympic Delivery Authority appointed a delivery partner to provide expert support and resource in managing the programme and to take control of overall management of construction activities. Crossrail Limited appointed a project delivery partner, to manage the contractors responsible for the construction of the Central Section Works and the interfaces with other parties such as Network Rail and London Underground. It also brought in a programme partner to provide overall programme and project management and control. 3.14 The Authority has appointed its Sellafield Programme Director as Senior Responsible Officer for the transition to the new model, and has set out an outline plan for the transition programme, which it expects to further develop with Sellafield Limited and Nuclear Management Partners. The Authority will firm up the plan by May 2015. • appoint programme partners as required. 3.15 While the transition process is underway, the Authority expects that staff from Nuclear Management Partners will continue to lead and work on the site, to ensure maintenance, safety, security and delivery over the transition period. Following share transfer, Nuclear Management Partners’ staff will progressively move out of their roles and be replaced by a new management team over a period of six months. As with previous years, the Authority expects there to be fees available to Sellafield Limited during the transition period and that these will be linked to performance on the site. However, the Authority is in the early stages of defining how Nuclear Management Partners will be incentivised and compensated during transition. The Sellafield workforce is one of the key stakeholder groups and the Authority considers that, on the whole, they are likely to be supportive of the change. The Authority states that it will augment its capacity to manage the change with advisers; a senior, interim appointment to help manage the process; and use of project management capability within Sellafield Limited. The Authority is confident in the capability of the current chair and managing director to start the process. The Authority and Sellafield Limited are taking advice from the market about the availability of suitable companies and expect to apply lessons from other relevant best practice and the Authority’s competitions, which it has overseen for other nuclear sites. The Authority expects to take steps to improve its capability as sponsor of Sellafield Limited to help realise the expected benefits. A related risk is that Sellafield Limited is unable to incentivise the strategic partner and programme partners in a way that provides the expected performance improvements. As mitigation, the Authority’s contract management team will support Sellafield Limited with the procurement and contractual terms for the strategic partner, and the Authority and Sellafield Limited will seek the support of the strategic partner with the development of contractual incentives for programme partners. See Figure 12 on pages 28 to 31.
see more here downloading PDF file here. LIVESTREAM LINK FOR Helen Mary Caldicott's SYMPOSIUM IN NYC ON FEB. 28TH-MAR 1ST! A senior official of Japan's Nuclear Regulation Authority's secretariat has indicated that he has no idea when it can lift an effective ban on test runs for the prototype fast-breeder reactor Monju. The investor selected for the development of the units 3 and 4 of CNE Cernavoda is China General Nuclear Power Corporation (CGN). Viktor Orban ha deciso di coprire con il segreto di Stato l’accordo con la Russia per lo sviluppo della centrale nucleare di Paks a sud di Budapest. La legge voluta dal premier magiaro e approvata dalla sua larga maggioranza in Parlamento proteggerà per trent’anni ogni informazione sulla tecnologia impiegata e sugli investimenti economici di un progetto nel quale la Russia di Vladimir Putin investirà dieci miliardi di euro sui 12,5 miliardi complessivi. ☢ ☢ Fessenheim, spenta centrale. 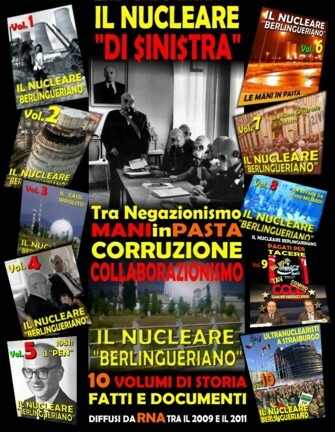 ☢ Piacenza: Bonaccini: "No al deposito di scorie nucleari. 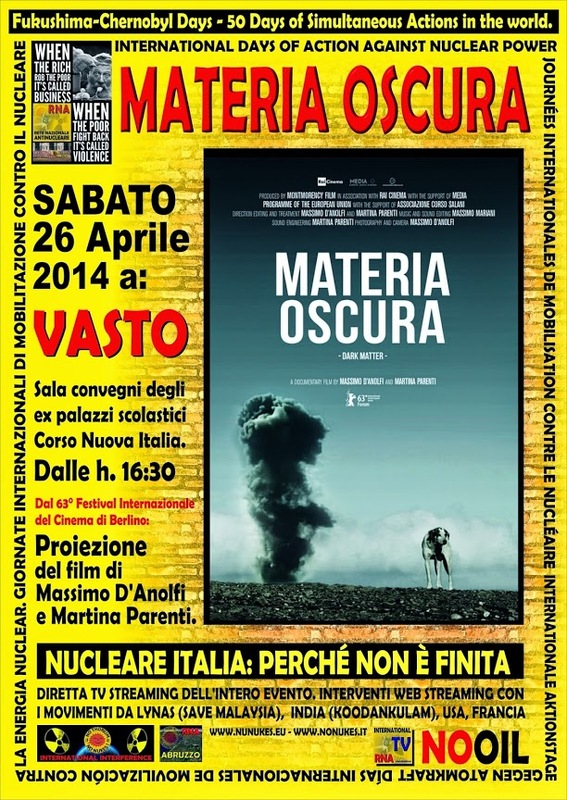 Caorso ha già dato"
☢ Poiatica, si indaga sulla radioattività della discarica. Iren: "E' tutto in regola"
Secondo la Corte dei Conti inglese, saranno necessari 73 miliardi di euro e 105 anni per completare i lavori nell'immenso cantiere. I lavori che dureranno 15 anni e a cui parteciperanno mediamente 200 specialisti. 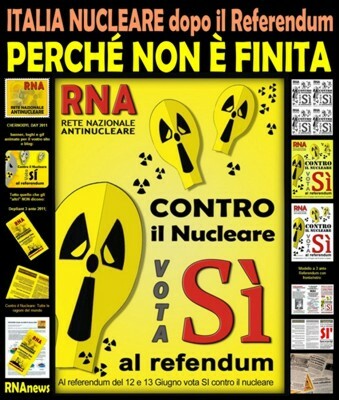 L'operazione dovrebbe costare circa 800 milioni di franchi, di cui poco più della metà verrà dal fondo per la disattivazione degli impianti nucleari. Il progetto deve ancora ottenere il via libera delle autorità.